Synod’s own rules and regs, and the procedures for doing the business. In this we were greatly helped by some roleplaying by old Synod hands pretending to be Archbishops, Chairs, incompetent members doing things the wrong way, etc. Full briefings from the leading people on what are likely to be the two main themes of this Synod: ‘Reform and Renewal’ ( or ‘RnR’ as we call it here – see my preview post) and ‘Human Sexuality’. The sheer pressure of meeting a couple of hundred new people and being nice to them all day. The Synod staff team gave very good explanations of the legal stuff and the debating processes. We had some fun trying out the electronic voting system with spoof motions about preferring coffee to tea (coffee won). My fears about the new machines are unfounded: they are easier to use than the old ones. There were two occasions when it all went very quiet, The first was when two Met Police officers gave us a security briefing. They included an extremely powerful video on what to do if a firearms incident occurs near you. With Paris on our minds, and a royal occasion in the morning, everyone listened carefully. The byword was Don’t be alarmed, but be alert, and we were reassured there is no intelligence to suggest tomorrow is likely to be a target of any kind. If you’re concerned about how we deal with terrorist threats, the general thrust of the approach can be seen here. The second seriously attentive moment was when David Porter gave a brief account of the Shared Conversations on Scripture and Human Sexuality. He reminded us that when Synod undertakes it’s own event in July at York, we will be responsible for one another. It will be about listening, not talking, and about finding the voice of God in what is said and heard. It is not about changing minds, but about changing the way we converse about human sexuality (and other issues). It seems slightly unfair that only those attending today heard David Porter’s address. It would be good if copies were made available to everyone on Synod as they get next July into focus. I might try and speak in the debate on the agenda about that. The demographics are against us and we can’t stop people dying. You need to change the demographics of the clergy to change those of the congregations. 40% of priests will retire in next ten years. Many are tired and would like to stop. He was listened to carefully, but when it came to questions, they were quite detailed and technical, indicating the unease that is felt by many about the small print of all this. Archbishop Justin will give a Presidential Address – almost certainly a combination of biblical reflection, comment on current issues and a synodical lookahead. RnR is the main discussion topic, with presentations and questions. Hopefully, John Spence will have some new gags and a fresh take on the programme. But others will be on the platform too to cover the non-financial bits. Questions ends the day – always interesting, often entertaining. The power of the blog never ceases to amaze me. Monday’s preview post had had 70 views by bedtime, including someone in Bolivia who read 8 of my posts. (I am told an absentee member is in Latin America at the moment, so perhaps it’s her…) Other countries recently inspecting bathwellschap include Sri Lanka and Zimbabwe. Not to mention lots of UK people. Andrew Nunn, the Dean of Southwark has captured the ‘beginning of term’ atmosphere brilliantly in his blogpost today (read it here) – and he reminds us to pray for Synod. Feel free to do so as you close this page down! *What did you learn in school today? Top folky Tom Paxton’s sarcastic look at conformist education, from his 1964 album Ramblin’ Boy. 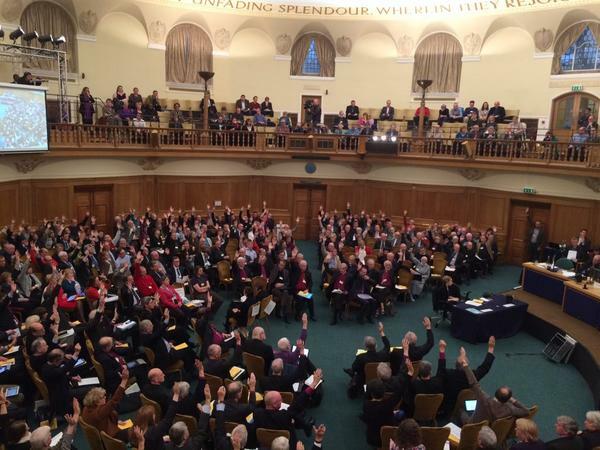 This entry was posted in 2015: Nov - London, General Synod and tagged Church of England, electronic voting machines, General Synod, Reform and Renewal. Bookmark the permalink.